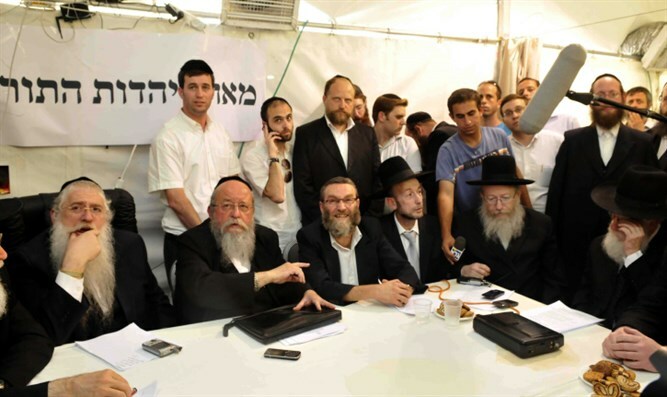 The United Torah Judaism party (UTJ), which was celebrating its growth to eight Knesset seats in the elections this week, is now feeling pressure as the latest count appears to move its eighth seat to the Meretz party. UTJ is now just a few dozen votes shy of that eighth seat, which had previously seemed safe, as the Central Elections Committee is coping with a spate of irregularities in the reported votes. The party which is benefiting at UTJ's expense is the far-left Meretz party, the Kikar Hashabbat website reported. Earlier, UTJ was said to be hundreds of votes short of winning an eighth seat. That gap has since fallen to just a few dozen votes. UTJ has established a hotline under the guidance of members of the Elections Committee Avraham Weber of the Degel Hatorah faction and Attorney Avraham Justman of Agudah. There are about 30 phone callers, who call every observer who acted on behalf of the party at the election polling stations, in order to compare what was written by the observer to what was recorded by the Election Committee, and perhaps find lost votes. So far over 2,000 errors have been recorded which caused votes for UTJ to be counted for the Labor party. A message was distributed to party activists: "Share - for the eighth mandate not to go to Meretz. We are urgently asking representatives of the United Torah Judaism to go to the polling secretaries, committee members and observers to report specific irregularities." "The situation at the moment is that we have a small gap, and there are irregularities in the data. The gap can be overcome by identifying specific incidents, counterfeit or irrational results, examining them and fixing them. "At the moment, there are ballot boxes that do not have any UTJ voice, and we've already saved thousands of votes in this way!"